Settle in as Funko Rick and Morty Mystery Minis Series 2 packs even more interdimensional excitement. Round two brings new faces, new versions of familiar faces, and multiple Rick and Morty exclusives. Issuing figures via blind-box packaging, Funko Rick and Morty Mystery Minis Series 2 naturally builds upon the first installment from 2017. Again, many have a resemblance to the Pop! versions, including Warrior Summer, Hemorrhage and Morty with Armothy (a.k.a. Sentient Arm Morty) from the post-apocalyptic Earth, plus the mildly terrifying Pickle Rick and Scary Terry. Buy Rick and Morty Mystery Minis Boxes on Entertainment Earth. New options include the janitor for the Vindicators, Noob-Noob, as well as Phoenixperson, which is the cyborg version of Birdperson. There's also the amoeba Dr. Xenon Bloom, who runs Anatomy Park, and Prince Nebulon, the Zigerion ruler. Although the Funko Rick and Morty Mystery Minis Series 2 checklist is not too daunting, the exclusives complicate matters as it means collectors must visit multiple stores to complete the set. Some of the key members of the Vindicators (Million Ants, Supernova and Vance Maximus) are only found in GameStop boxes, while Alan Rails and Crocubot join Cornvelious Daniel at Hot Topic. In addition, Target is where you need to go for Jaguar, Toxic Rick and Toxic Morty. All together, that equals at least 21 figures in the set. 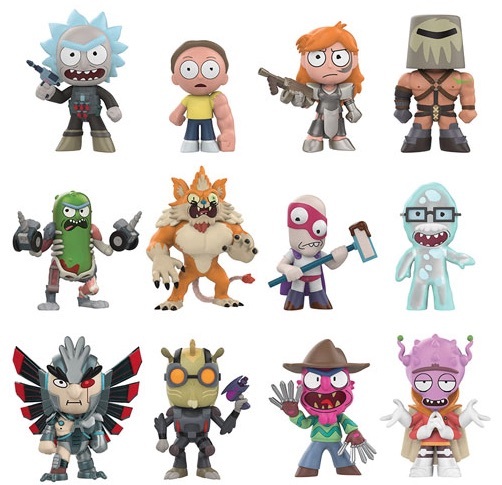 Individual figure odds are another thing that can cause problems for collectors of Funko Rick and Morty Mystery Minis Series 2. The rarity info is not currently available but will be updated as soon as possible. Review additional Funko Rick and Morty details with our other figure guides.